When I received this, I was intrigued. 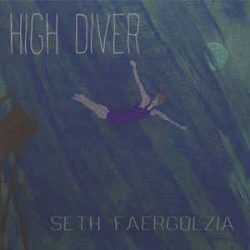 A bunch of songs taken from a larger bunch of songs, the results of a period where Our Seth was writing a song a day for a hundred days. Wow! Get that!, I thought. Let’s go! Press ‘play‘, “High Diver”: title track, good, decent; though something’s definitely off. Then “Rubbing It In” happens and there it is. Two tracks in and he’s had himself off. It made me think of the imperious Chilly Gonzales jamming with Kiwi ledges, Flight of the Conchords but sadly, it’s not. It’s a bad thing, and the cod Celtic mess that follows is worrying – despite saving itself after a couple of minute, I was left thinking, after the third song, “this guy’s made 20 albums? How come he doesn’t know what he’s good at yet?” because the absence of cohesion and identity just makes it a mess and unbelievable. Not unbelievably bad, just unbelievable; like everything in it is what it is. An idea considered and thought about for a short time and turned into a song. A song a day is a big strain on consistency and time, both of which are essential ingredients in the creation of quality, so it shouldn’t be a surprise if there’s a stinker or two. It ought to be expected, in fact. But still. What I’m really thinking by now is, if these are the best songs from that period, those sessions, then it’s bobbins. They all are. They’re just silly songs. “Garbage Night” is the most apposite example. It shouldn’t be so bad, as there’s definitely a song in there that could have been lovely, but it ends up being something you never want to hear again. And “Berlin” makes you wonder if it actually is a piss take. See, put another way, if Flight of the Conchords did do these songs, the paradigm shift would have you smiling and enjoying it and finding little fault because, y’know, its funny. But they’re not, and you aren’t, and so much here is irritating and it doesn’t lessen with repeat listens. In fact, it gets worse, as what becomes abundantly clear is how unquestionably talented Seth Faergolzia is, and just how much he’s unfairly represented himself here. Unless of course, he is taking the piss. Fingers crossed. Less is more. Not at all is better.